Since 6×4.5cm size camera is the half size of the standard 6×9cm, it has been called "semi format" which was so popular in the 1950's, the golden age of spring camera, due to its wasteless feature. The former type Pentax 645 that appeared in 1984, making its debut as "super field camera" with built-in eye level finder and motor drive, being functional and mobile as much as the 35mm single lens reflex camera. 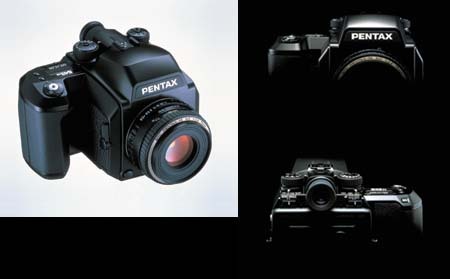 The Pentax 645N introduced in 1997 is a refined model with auto focus system applied to this type first in the world. The large dials set on both sides of the finder is based on the famous analogue interface designed for the 35mm single lens reflex MZ series, superior in its speedy action so comfortable for our eyes. In addition, there are many more wonderful ideas that make us smile, such as the visibility adjusting dial, drive mode dial, preview lever, and condition check system inside the finder. For certain, this product shall satisfy users who wish to switch from 35mm single lens reflex camera to the mid size model in this contemporary trend of the 35mm type being larger than ever.